Experience a glamorous luxury sailing holiday on an exquisite boat, on the beautiful La Perla in Croatia, built in 1976. This luxurious beauty is a classic and spacious motorboat, with an attractive interior design. 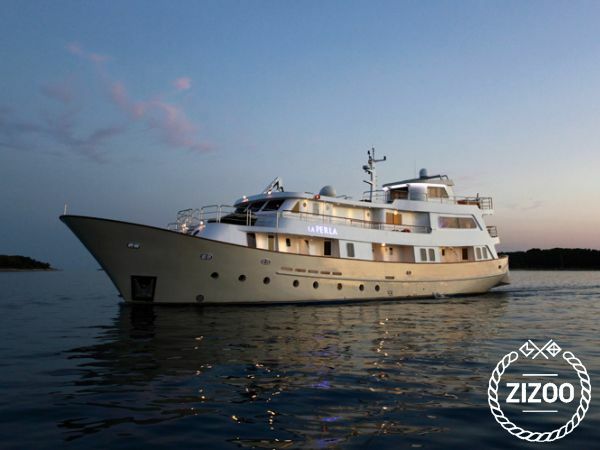 She will welcome 26 guests in her 13 double bed cabins, saloon, kitchen, dining room and 13 bathrooms. You will love her enormous living area and upstairs deck, which could not be more perfect for relaxing in the sun, or indulging in delicious local cuisine. Grab a glass of top-quality Croatian wine and enjoy your private week of luxury, exploring the coast on board the La Perla. Chartered from Split marina on a weekly basis, she comes with full safety equipment for adults and children. Ask your friendly luxury yachting professionals for some suggestions, they will be happy to help and provide all the support you might need.